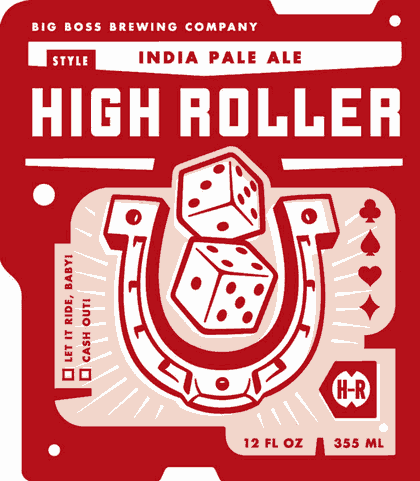 Raleigh, NC's Big Boss Brewing Co. has a couple labels that came through Beernews.org that I really like. 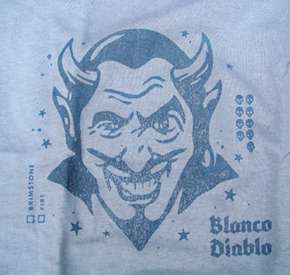 The first is the Blanco Diablo, a Belgian White with a devil theme. 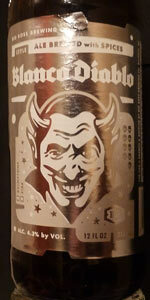 Devils and demons are a big theme in beer artwork, and a little bit of a pet subject for me. First, here's the image, designed by McKinney Advertising and graphic artist Scott Pridgen (ed. The hotlinked images were gone, so I replaced with a bottle picture and a t-shirt graphic). Pridgen has a retro style that I dig, spiced with punk stylings. The things about this that work for me are the small subtleties that distinguish it. For one, the use of white and gray for the devil is a nice change for the black and red motifs we see so often. I also like the asymmetry of the devil's expression, with the cocked eyebrow. I don't know what the nine skulls on the right side are about, but the color palate keeps the work light instead of menacing. More straightforward. Pridgen clearly has established similar compositional elements with the abbreviated names in the bottom right, and a choice of two humorous options running up the left side (I have no idea if those are actually functional for something, or just stylistic).